Sarah Duckett had only been home from the hospital for a week with her second baby when she sensed something just wasn’t quite right. She didn’t feel like herself; something was off. Her heart was beating rapidly just from walking across a room. It was hard to get a breath in without coughing. 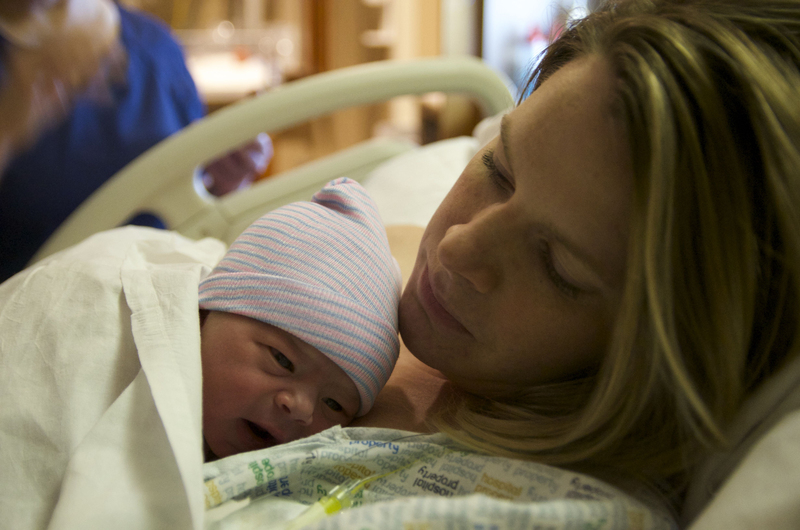 She remembered a handout her nurse had discussed with her—post-birth warning signs—could this really be happening to her? She never thought those warning symptoms her nurse discussed would happen to her. After all, hers had been a perfectly uneventful pregnancy and normal birth. She asked her mom to get the post-partum warning signs sheet from her stack of hospital discharge papers. Sarah’s mom took her to the ER, where she received a blood pressure check, several lab tests and then a chest x-ray and CT scan, which revealed a small blood clot in her lung. She recalls having mixed emotions, and through tears she said “I feared not knowing if I was ever going to hold my baby again.” She struggled to believe that without risk factors, this was still happening to her, and potentially threatening her life. While Sarah was hospitalized for treatment, she made a point to thank her nurses, grateful that they had told her that shortness of breath and difficulty breathing could be a warning sign of a serious post-birth complication. In this case, postpartum discharge education and trusting her instincts saved Sarah further complications, possible injury, or even her life. An increasing number of women are dying from pregnancy-related problems before, during and after their baby’s birth. More than half of all mother’s deaths in the U.S. happen after baby is born and goes home from the hospital. At least half of all pregnancy-related deaths among mothers are preventable! While some women may be at higher risk of developing complications than others, ALL women are potentially at risk of developing post-birth complications. If you are surprised by these facts, you’re not alone. Many moms return home from the hospital, tired and overwhelmed with the excitement of a new baby. 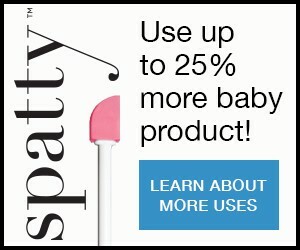 Naturally, you’re more so focused on caring for your new baby. But it’s important to pay attention to your own health, and be diligent in looking for signs and symptoms that could mean you’re having a post-birth complication—especially if this is your first baby. You may not know what’s normal or not, what to do or who to call. For example, some bleeding after birth is normal and expected and should decrease over time; but do you know how much bleeding is too much bleeding—to the point it potentially puts your life in jeopardy? The mother/baby nurses of AWHONN have created specific instructions for postpartum moms called “SAVE YOUR LIFE: Get Care for these POST-BIRTH Warning Signs”. Learn these post-birth warning signs because knowing how to recognize and respond to these specific signs and symptoms may help save your life. If you think you are experiencing one of the post birth warning signs, it’s important to get help and let the person responding to your needs know that you’ve just had a baby within the past year. 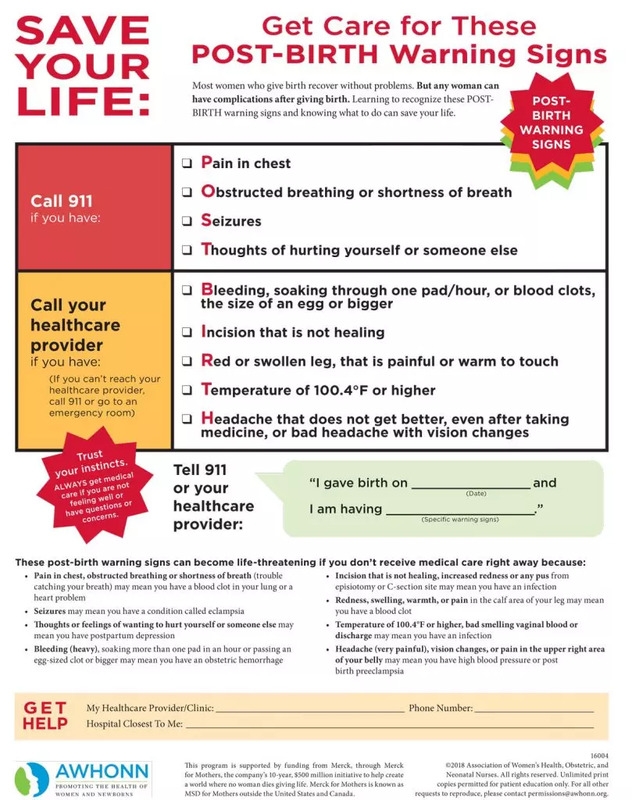 For example, if you call 911, tell the operator: “I just had a baby a week ago and I have a really bad headache that won’t go away.” Or “I had a baby on [Give the Date] and I am having some chest pain and trouble catching my breath.” Do this with any encounter you have when seeking help whether it’s with 911, an emergency room or urgent care provider, or your own healthcare provider. The sooner your nurse, midwife or doctor can identify your symptoms, the sooner they can make a diagnosis and provide the necessary care. Just as your nurse will share these instructions with you, please share this same information with your family and friends; you may not be able to act on your own, for example, if you’ve have had a stroke or seizure. Act on Your Instincts; Get Help! You receive a lot of instructions when you leave the hospital with your new baby. Trust your instincts. If you feel something is wrong or you just don’t feel quite right, always call and get evaluated by your healthcare provider. If your symptoms worsen or you do not hear back from your healthcare provider, call 911 or go to the nearest emergency room. Learning the most common post-birth warning signs can save your life or the life of someone you love.